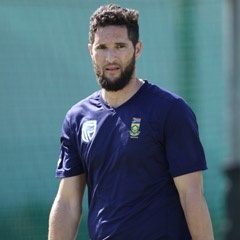 Cape Town - Proteas all-rounder Wayne Parnell will return to action and be a massive boost to the Cape Cobras' bowling attack for the T20 Challenge. The Cape Cobras lost by 15 runs to the Dolphins in the opening T20 Challenge match at SuperSport Park in Centurion, according to the D/L method of recalculation. The attack, which suffered at the hands of Sarel Erwee (103) and Khaya Zondo (67) on Sunday, will no doubt be bolstered by the return of Parnell. Parnell, when on song, is a match-winner with both bat and ball in any format of the game. He is particularly devastating when opening the innings and can also swing it both ways at pace. The Proteas paceman has taken 166 T20 wickets and produced best-ever figures of 4-13. "Wayne bowled at 80 percent intensity at three-quarters of his run-up last week and the idea is that he will be able to operate at 100 percent starting with training on Tuesday," said Shane Jabaar, the Cape Cobras physiotherapist. Parnell was indisposed due to a groin injury, but his rehabilitation gathered steam in the lead-up to the opening match on Sunday against the Dolphins. Cobras coach Ashwell Prince resisted the temptation to unleash Parnell while he was not 100 percent. Prince said it would have been a bit of a lottery to pick Parnell for the maiden clash of the campaign. The Cobras could not hit the right lengths - short of a length - in the first six or seven overs on Sunday and the Dolphins were off to a flyer, striking a record score of 231 for two. The valiant Cobras, attempting to chase down 124 in 10 overs after lightning had forced a reduction of the overs, struck 108 for three, courtesy of Hashim Amla and Aviwe Mgijima. Amla (52, 27 balls, 3x4, 4x6) and Mgijima (37, 19 balls, 3x4, 2x6) produced a breath-taking rescue-attempt, sharing in an 88-run partnership off only 40 balls. They came close to the century-stand, off only 55 balls, between Zondo and Erwee, for the third wicket during the Dolphins’ innings. Jabaar said Tshepo Moreki, who had an injured finger, had a scan which revealed no fracture, but ligament damage. He was rested for the opening match of the T20 Challenge. He will move full steam ahead in the next few days as the Cobras prepare for the second T20 match against the Highveld Lions at the Wanderers Stadium on Friday. The Cobras will then be back at SuperSport Park, Centurion on Sunday where they will meet the Titans.